We are living in the dispensation of the Holy Spirit. He is the Executive of the Godhead. When Jesus left the world, he declared: "It is expedient for you that I go away: for if I go not away, the Comforter will not come unto you; but if I depart, I will send him unto you. And when he is come, he will reprove the world of sin, of righteousness and of judgment ... Howbeit when he, the Spirit of truth, is come, he will guide you into all truth ... He shall glorify me: for he shall receive of mine, and shall show it unto you. The Comforter, who is the Holy Ghost, whom the Father will send in my name, he shall teach you all things, and bring all things to your remembrance whatsoever I have said unto you ... He shall testify of me" (John xiv. 26; xv. 26; xvi. 7-15). What volumes of truth are compressed into these few sentences. We are distinctly told that it is better for the church and the world that Christ should withdraw His bodily and visible presence, because the unseen, omnipresent Spirit would be more helpful than the incarnate Lord visible, but confined to one place. And the mission of the Spirit is revealed. He shall convict sinners of sin and testify of Jesus. He will "guide believers into all truth," and "show Christ'' to them as an all-sufficient Saviour, and "teach them all things," and clothe them with "power" (Acts i. 8), "being sanctified by the Holy Ghost" (Rom. xv. 16). May the Lord open our hearts to take in these glorious truths, not half appreciated by an unspiritual church in these modern days. Let us remember that while the Spirit is universally present with men, His especially potential presence must be prayed for. Jesus said (Luke xi. 13): "If ye then, being evil, know how to give good gifts unto your children, how much more shall your heavenly Father give the Holy Spirit to them that ask him?" Here then, is from the lips of Jesus a remarkable encouragement to definite prayer for the Holy Spirit. The argument appeals to the tenderest feelings of the parental heart. As a suffering child, pleading with its mother for bread to satisfy its hunger, is not mocked with a stone; as a father does not taunt his starving boy with the gift of a SCORPION, so God, our heavenly Father, will not mock our hungry souls when we cry for the gift of the Holy Ghost. What an encouragement to pray! What a sweet assurance that the heavens are not brass above us; that the throne of grace is not inaccessible, and that God is not deaf to the cries of His spiritually needy children. Prayer is a thing of divine appointment. The voice of petition is as sweet to the ear of the Infinite as a seraph's song, and prayer is the most pleasing incense that rises to the Omnipotent's throne. Therefore, in spite of all the clamorings of doubts and doubters, "men ought always to pray and not to faint." Moreover, the words of Jesus imply that the great need of His followers is the gift of the Holy Spirit. Without Him souls faint and perish, as bodies languish and die without food. No divine life without Him, no acceptable prayer, no appreciation of Jesus, no understanding of the Word, no swiftness in the heavenly race, no efficiency of service, no growth in grace, no fullness of life, no sanctification of the heart. With what inexpressible longing, then, with what importunity ought all Christians to pray for the gift of the Holy Spirit! Life, usefulness, preparation for heaven -- everything that intimately concerns the spirit of man for time or eternity depends upon the helpful work of the Holy Ghost. You will notice that the coming and work of the Holy Spirit were the great themes of Christ's last conversation with His disciples, and He dwelt upon them with special emphasis as being supremely important to His Church for evermore. Have we, as Christians, been sufficiently alive to this fact? Have we realized that we are nothing, and there is nothing for us worth having if we are to be without the friendship and assistance of this Divine Power? Surely we may agree with Owen, that "He should be the great subject-matter of all our prayers, and that the principle work of faith in this world is this asking of the Spirit of God." I. That only so can we have the indwelling of God in our souls. We are by nature dead to things holy. There is no life in us. So God entreats us to "be filled with the Spirit," "and alive unto righteousness," and "dead unto sin." In other words, not until God, through the Spirit, makes our hearts His abode can we live worthily, having a Christlike attitude toward sin and toward holiness. It is by the Spirit that we abide in Christ, and He "in us the hope of glory." In answer to importuning prayer He overshadows man now as of old and fills us, and we become the temple of the Holy Ghost. The souls of believers actually become His dwelling place, so that He is personally present with them in such a way as to inspire in them spiritual life and holy affections. "They that are in the flesh can not please God. But ye are not in the flesh, but in the Spirit, if so be that the Spirit of God dwell in you. Now if any man have not the Spirit of Christ, he is none of his. And if Christ be in you, the body is dead because of sin, but the spirit is life because of righteousness" (Rom. viii. 8-10). What less can this wonderful language mean than this: through the indwelling of the Holy Spirit we become partakers of God's life. This is the only source of whatever spiritual life we can ever possess. This is the secret of holiness, the crowning blessing, the source of all other spiritual blessings - this indwelling of the Spirit in the heart of man, the union of the human with the Divine. And for this preeminent gift Jesus taught us to pray. II. We need to pray for the Holy Spirit that we may have a better appreciation and a clearer perception of the truths of the Bible. "The Spirit shall teach you," said Jesus. The mysteries of God's wisdom are "revealed unto us by his Spirit," said Paul, because we are "strengthened by his Spirit in the inner man.'' "For to one is given by the Spirit the word of wisdom; to another knowledge by the same Spirit" (I. Cor. xii. 8). "When he, the Spirit of truth, is come, he will guide you into all truth" (John xvi. 13). "But the natural man receiveth not the things of the Spirit of God: for they are foolishness unto him; neither can he know them, because they are spiritually discerned" (I. Cor. ii. 14). Is not this the most pointed intimation that we need the Holy Spirit's illumination in order to understand the Word? By perusing the Scriptures daily, and pondering the revelations God has made of Himself of Christ, of redemption, and of things unseen and eternal, in the same way in which we study algebra an d history, much indeed of a certain kind of biblical knowledge can be gained. Such study should not be neglected. But yet there is a heart-acquaintance with truth and experience of it, a spiritual insight into the Gospel, an apprehension and comprehension of Divine things which it can never give. There is much in the Scriptures that the unaided intellect will never discover, appreciate or understand. It is the Spirit's Book, and the Spirit is its best Commentator and Interpreter. There is a heavenly light to be given, and a heavenly eye to perceive its radiance, which only the illuminating Spirit can impart. There is a quickening of the soul, an unwonted appreciation of divine truth, a sensing of heavenly things that is born only of the Spirit of God. "The unction of the Holy Spirit," says Dr. Steele, "is the highway to all knowledge. This is especially true of an insight into theology. "Hence the Holy Ghost is the only conservator of orthodoxy." Says Samuel Rutherford: "If you would be a deep divine, I recommend to you sanctification." John Bunyan, imprisoned for years in Bedford jail, with no library but the Bible and no teacher but the Holy Ghost, had a diviner insight into the things of the kingdom, and more exalted visions of glory and views of God than ever came to the pampered but scholarly bishops of his day. "Who knoweth the deep things of God but the Spirit of God," and who but He reveals them unto the heart of man in answer to prayer? I can not help thinking that if the theological professors of our country for the last forty years had sought the Baptism with the Holy Ghost and His illumination with half the zeal that they have studied the writings of tobacco-befogged and beer-soaked German rationalists, they would have sent us out a Spirit-anointed ministry, with vastly better equipment for the service of the churches and the cause of Christ than we received at their hands. Rev. A. B. Simpson says: "It is wonderful how the untutored mind will often, in a short time, by the simple touch of the Holy Spirit, be filled with the most profound and Scriptural teaching of God, and the plan of salvation through Christ. We once knew a poor girl, saved from a life of infamy and but little educated, rise to most extraordinary acquaintance with the Scriptures and the whole plan of redemption through the simple anointing of the Holy Spirit. We simply give to Him our spirit, and He fills it with His light and revelation." Hear the scholarly commentator and flaming Southern evangelist, Dr. Godbey, who can read his Bible in nine different languages and dialects, and has for fifteen years used no New Testament but the critical Greek. With all his college learning, he preached fifteen years "an utter failure as a soul-saver," "committing the awful blunder of substituting my intellect and education for the Holy Ghost." Then he sought the Holy Spirit anointing. Listen to him now, in the ripeness of his maturity: "What is this spiritual gift of knowledge? It is insight into divine truth. As the Holy Spirit is the Author of the Bible, He alone understands its meaning. Man teaches the intellect, but the Holy Ghost teaches the heart. Many people think the mind is greater than the heart, but they are egregiously mistaken. The heart is the man himself, the mind being his servitor. The gift of knowledge reveals to you the deep, hidden meaning of God's Word. "Many years ago an old Methodist bishop said to us young preachers: 'Young men, God can teach you more in a minute than men can teach you in a year.' That strange, and to me paradoxical, statement lingered in my memory, and made an indelible impression on my mind. Years subsequently, when the Lord led me into Beulah Land (sanctification), and imparted to me the gift of knowledge, I for the first time understood the old bishop. I graduated at college, and ransacked all the world for books, and gathered me up a library at the cost of one thousand dollars, thinking I would have to study those books in order to be an efficient preacher. About that time the Lord gave me sanctification, flooding my soul with celestial fire, and transforming the metaphysical preacher into a flaming revivalist. The fire swept through me night and day, from the crown of my head to the soles of my feet. I preached four to six times a day, moving in a revival cyclone the encircling year. I was compelled to bid farewell to my library, give up sermon-making, and devote all my time to saving souls. Consequently, I consecrated all my fond aspirations to understand the Bible, and went forth, content to cry, 'Behold the Lamb of God, that taketh away the sins of the world!' having forever abandoned all my cherished aspirations to understand the Bible. Anon, to my unutterable surprise, I find myself surrounded by preachers and people with open Bibles, listening to my expositions of the inspired Word. That God would use me as a teacher of the Bible seemed to me a paradoxical dream. But what is the solution of the mysterious problem? The Holy Ghost has revealed to me His Word. The spiritual gift of knowledge is the golden key which unlocks the Bible. This explains how Bob Burks, when converted and sanctified, could lucidly and forcibly explain the Scriptures, though he could not read a word. This is the reason why the illiterate women of the Salvation Army are better preachers than many college graduates who fill our city pulpits. "God is raising a kingdom out of the slums and jungles to preach His Gospel and save the world. It is a significant fact that the poor backwoods circuits enjoy a purer Gospel and a more vital Christianity than the wealthy stations, because the poor, illiterate circuit-riders are taught by the Holy Ghost, while the learned pastors are taught by men. Human learning is all right in its place, but it is a blighting curse when made a substitute for the knowledge which none but the Holy Ghost can impart. "Reader, if you would understand the wonderful revelations of God's Word, give up all your own wisdom and sit down meek and lowly at the feet of Jesus, and abandon yourself to the Holy Ghost, that He may teach you the deep things of God. We learn, in I. Cor. iii., that the first lesson in the school of Christ is to find out that we are fools. I. Cor. ii. teaches us that the Word of God can not be discerned by the human intellect. The Holy Spirit must teach your spirit His revealed Word and will, or you will remain a spiritual ignoramus. God's Word is the sword with which we are to conquer the world, flesh and Satan. You do not need colleges and theologians to reveal to you God's Word, but you need the Holy Ghost to illuminate it. "D. L. Moody, the world's evangelist, is an unlearned layman. Yet he is a master in Israel, at whose feet theologians of all nations would do well to sit and learn the Word of God. He is a wonderful example of this spiritual gift of knowledge. Amanda Smith is an illiterate colored woman, born and reared in Southern slavery, yet she has preached to myriads in America, Europe, Asia and Africa, and is wonderfully luminous in the Word of God. She is one of the most efficient preachers in the world; the secret of the matter is, she is taught by the Holy Ghost the deep things of God. You can not afford to be without this gift', ("Spiritual Gifts and Graces," pp. 18-20). Once a Christian woman came to Dr. Keen, and said: "I don't love to read the Bible; I haven't a relish for it. I prefer to read the magazines and the best authors. There must be something wrong. I know I ought to love the Bible." He replied to her: "There is something wrong. You need the baptism with the Holy Ghost that will unseal the Book and illuminate its pages, so that your soul will exclaim, 'How I love Thy law!' " She sought the Spirit, and in two months she said to Dr. Keen: "O! the Bible is a changed book. It is such a precious book! I only wish I had more hours in which to linger over its pages." Oh, how sadly do all believers need the Spirit, that we Christians may behold new and wondrous things out of God's law; that our neglected Bible may have for us an unwonted charm - a heavenly fascination - for evermore. III. We need to pray for the Holy Spirit, that we may have a more perfect assurance of the love of God. Probably all true Christians have a more or less satisfying idea that God loves them. But, alas! with many it is only a dim, trembling hope, that scarcely amounts to confidence. There is very little peaceful, restful assurance in it. Multitudes have long periods of painful doubt and darkness, until they come to question the reality of their own piety, and even the love of the blessed God. Who does not see that this is not ideal Christian living? The Sacred Page says of God: "I have loved thee with an everlasting love. Therefore with loving kindness have I drawn thee." "As the Father hath loved me, even so have I loved you." "The hairs of your head are all numbered." "Fear not, little flock; for it is your Father's good pleasure to give you the kingdom." O, blessed Jesus, what love -- matchless, infinite, eternal! And yet, to the weak apprehension of Thy children, it is all unreal. Thou dost seem more distant from us than the stars and the sun. In times of trouble it seems as if Thou hadst forgotten Thine own. But when Thy Spirit comes the veil is lifted, and we behold, with open vision, the glory of God. Nothing now seems so real as Thy love, for it is "shed abroad in our hearts by the Holy Ghost," as the light of the sun is poured upon the earth in the morning. When the baptism with Thy Spirit comes we know and believe the love that God hath to us" (I. John iv. 16). We are "able to comprehend with all saints what is the breadth, and length, and depth, and height; and to know the love of Christ which passeth knowledge" (Eph. iii. 18, 19). Dear reader, it is the coming of the Holy Spirit that makes God's love a blessed reality to the soul, out of which come hope and peace and joy and all foretastes of heaven. He came upon Mrs. President Edwards in 1742, and she wrote: "I can not find language to express how certain the everlasting love of God appeared; the everlasting mountains and hills were but shadows to it. My safety and happiness and eternal enjoyment of God's immutable love seemed as unchangeable as God Himself. Melted and overcome by the sweetness of this assurance, I fell into a great flow of tears, and could not forbear weeping aloud ... All night I continued in a constant, clear and lively sense of the heavenly sweetness of Christ's excellent and transcendent love, of His nearness to me and of my dearness to Him, with an inexpressibly sweet calmness of soul, in an entire rest in Him." The Spirit came upon the Rev. Wm. Tennent when he was in the woods in prayer, between the morning and afternoon service, and in a trance "heaven came down his soul to greet," and, like Paul, he saw and felt things unspeakable. An humble woman in Massachusetts told the writer that the Holy Spirit came upon her, and the tears streamed down her face all the day as she stood over her wash-tub, for her excessive raptures of joy from the conscious love of God. Oh, for such a comforting assurance -- a perpetual consciousness of the love of God in the hearts of all believers. Then would the "oil of joy take the place of mourning, and the garment of praise be given for the spirit of heaviness." The light of the Church of Christ would be as the morning, and her brightness as the noonday, and God would be her peace and our God her glory. Instead of being a feeble, sickly folk, w e should march to conquest and victory like an army thrilled by the music of heaven, ever conscious that God's "banner over us was love." Now, where is the remedy? Who shall instruct our minds, and give us the discerning vision and steady our tottering feet? I know of but one power that can meet the emergency -- that Holy Spirit that is appointed to guide us into all truth, and keep us from foolish and carnal things. "Ye are not in the flesh but in the Spirit, if so be that the Spirit of God dwelleth in you." He only, by dwelling in us, can give the divine guidance, the spiritual discernment that can infallibly penetrate beneath the guise of things and make us superior to the enticing allurements of a wicked world. V. We need to pray for the Holy Spirit that we may properly appreciate CHRIST. Jesus said: "When he is come, he shall glorify me." He magnifies the person and offices of Christ to the soul. So much did the saintly Finney appreciate this fact that he wrote a whole book about the work of the Spirit revealing Christ to us. I should like to quote from its glowing pages; but, as usual, I am writing far away from home and my library. He names, if I remember, some fifty or sixty offices of Christ which the Holy Spirit makes real to the soul. They are such as these: Christ as "Immanuel," "Counsellor," "God," " Prince of Peace," "Way," "Truth," "Life," "Shepherd," "Lord," "Master," "Redeemer," "Saviour," " Prophet," '' Priest," " King," our "Wisdom," our "Jesus," our "Righteousness," our "Sanctifier," our "Mediator," our "Bread of Life," our "Water of Life,'' our "Intercessor." In scores of pages Finney proceeded to tell in a thrilling way what the Spirit had revealed to him about Christ. None need fear that by exalting the person and work of the Holy Spirit Jesus will thereby be obscured. The fact is, only by honoring the Holy Spirit and receiving Him into the heart can we have any adequate appreciation of our blessed Saviour. Had the Holy Spirit been duly appreciated and honored and prayed for, Unitarianism, that so degrades the person and atoning work of Jesus, would never have been heard of. Mr. Stead, of London, said most pertinently not long since: "What the world now needs, is 'Christs' " -- people who reproduce the life and Spirit of Jesus. Such the people of God become when, by the anointing of the Holy Ghost, Jesus becomes properly revealed to and fully incarnated in the heart. Christ came to reveal the Father to men; the Spirit comes to reveal Christ to men. "When the Comforter is come ... he shall testify of me" (John xv. 26). "He shall not speak of himself " (John xvi. 13). That is the literal truth. The Spirit talks to the heart of Jesus, till Christ becomes unspeakably precious and real. A s Dr. Keen says: "He [the Spirit] holds Himself incognito, while He shows the things of Christ unto us. Bishop Thoburn's description of an Oriental marriage incident illustrates this beautifully. A prince, who is the bridegroom, seated under a canopy on a great white elephant, is escorted at midnight to the house of the bride; torchbearers, with lights on the end of long rods, walk beside the elephant -out of sight -- holding their lights so that the blaze shines full on the prince, exhibiting him in all his gorgeous attire and adornments. They are unseen, but the prince appears all glorious in the light which they throw upon him. So, when the Holy Ghost is received into the soul, He turns the full blaze of His indwelling presence upon the face of Jesus, and He becomes exalted and transfigured to the soul." Any system of theology that subtracts from or in any way belittles the person and work of the Holy Spirit will end by degrading Jesus and His atonement. "No man can say that Jesus is the Lord, but by the Holy Ghost" (I. Cor. xii. 3). One may have a cold, intellectual conviction of the divinity of Christ, but it is only when the Holy Spirit comes that one feels that He is divine, and rejoices in Him and adores Him, and enthrones Him Lord of all in the heart. And the Spirit manifests the presence and companionship of Jesus. He is felt to be with us and in us, because His Spirit has made us the temple of the Holy Ghost. Christ is "formed within" us, and is "in us the hope of glory" - a companionship real and abiding. This was what cheered Madam Guyon and John Bunyan in their dungeons for Christ's sake. The Apostle Paul said: "God was pleased to reveal in me his Son;" and after the Spirit anointed him, Jesus was ever real to his soul, and his Lord's promise was fulfilled, "Lo, I am with you alway." Protects me in this hostile land. With my almighty Friend so near. O wondrous bliss! O joy sublime! I've Jesus with me all the time!" Above all, the Holy Spirit, when He comes, will honor the Priesthood of Jesus, and open our eyes to recognize Him as the Anointer -- the Baptizer, "with the Holy Ghost and with fire." This gift is from Jesus. He ascended on high that He might "give gifts to men." 'His great gift is the Spirit. John Baptist said: "He shall baptize you with the Holy Ghost and with fire." Mr. Keen well observes: "Until the soul is anointed with the Holy Ghost it sees Jesus only as a sacrifice and Saviour. When it is filled with the Holy Ghost, He then is recognized as Anointer and Baptizer. For the lack of this generally in the church, Jesus is largely unknown and unhonored in His exalted character as the giver of the Holy Ghost" ("Pentecostal Papers," p. 134). "Jesus is not fully received until He is recognized in both offices, as Saviour and Anointer, and so soon as He is honored in the latter as in the former, He manifests Himself by giving to the soul the gift of the Holy Ghost. This truth, so clearly apprehended by t he Apostolic Church, has been obscured and well-nigh lost. But it is now dawning again, with all its gracious splendor, upon many hearts. A venerable and scholarly minister says: 'Those who are recognizing and heralding the Gospel of Jesus as the Baptizer with the Holy Ghost and with fire are in the foremost of the reformation of the twentieth century' " ("Pentecostal Papers," pp. 187, 188). O Christians, O churches of God, let us pray continually for the Holy Spirit, that He may open our eyes to see the glories of our ascended Lord! Then Jesus shall be more to us than a historical character that once lived and died and went away, we know not whither. He will then seem nearer to us than the nearest friend nearer than the hand that wipes away our tears - even an indwelling Saviour, who has all might, all power to baptize us with the Holy Ghost, and live in us a life divine. With the illumination of the Holy Spirit in us, we shall have a new, an anointed, vision to see Christ in His multiplied relationships and infinite glory till He shall become "chiefest among ten thousands" and the one "all in all." VI. We need to pray for the Spirit that we may be purged from sin and sanctified. A seraphim brought fire from heaven to Isaiah and put it on him, and said: "Lo, this hath touched thy lips: and thine iniquity is taken away, and thy sin purged" (Isa. vi. 7). Malachi prophesied of Christ that "He is like a refiner's fire ... and he shall purify the sons of Levi, and purge them as gold and silver, that they may offer unto the Lord an offering in righteousness" (Mal. iii. 2, 3). John Baptist said of Jesus: "He shall baptize you with the Holy Ghost and with fire." We are told in Acts that at Pentecost "there appeared unto them cloven tongues like as of fire" (Acts ii. 3); and that this Holy Ghost fire "purified their hearts" (Acts xv. 9). "Being sanctified by the Holy Ghost" (Rom. xv. 16). Here, then, is the great work of the Holy Ghost, foretold by prophets, realized by apostles, and promised of the Father to all believers of every age. This purging, sin-consuming, fiery energy of the Holy Spirit, burning the canker of sin out of our hearts, is the need of us all. As fire refines the gold, so does the Holy Spirit fire, when coming in Pentecostal power, purge out the "sin that dwelleth in us," and sanctify the heart. Then what growth in grace - what fruitfulness! "The fruits of the Spirit are love, joy, peace, longsuffering, gentleness, goodness, faith, meekness, temperance." And this glorious cluster of Christian graces is by no means a complete list of the fruits of the Spirit. There are adoration, obedience and gratitude toward God. There are justice, courtesy. pity and sympathy that go out toward our neighbor. There are humility, zeal, courage and the like - the holy characteristics of the renewed heart in which God dwells. We are by nature such lean and meager souls! Our hearts are so barren of all good! What can convert our sterility into fruitfulness and cause our desert life to blossom as the garden of the Lord? Only the HOLY SPIRIT. Four times in Scripture He is directly declared to be the source of our sanctification, and many times indirectly. Beloved, there is a growth of soul which we know little about -- a spiritual development far beyond what we usually see. There is a tenderness of conscience, a strength of holy purpose, a singleness of eye, a degree of devotion, a oneness with Christ, a victory over the world and a holiness of heart possible to God's loved ones, which few Christians attain unto. It is a state of rest in Jesus, a union with Him, in which the "old man" is crucified, and sin loses its power to charm, and the victory of faith is complete, because the life is hid with Christ in God, and we are the temple of the Holy Ghost. In Scripture language it is called "sanctification" -- a state in which everything is set apart as sacred, and "holiness unto the Lord" is written upon every faculty, and every employment, and every possession; and the soul, like Enoch of old, continually walks with God. Who does not hunger for such a life? What Christian is not weary of backsliding and succumbing to temptation and coldness of heart, and clouds, and doubts, and heaviness, and faintness of spirit? But victory comes not, and such life is not known, save as we are sanctified by the Holy Ghost. It is something to believe in, to long for and to pray for, until the unspeakable blessing is given. "God hath from the beginning chosen you to salvation through sanctification of the Spirit " (II. Thess. ii. 13). Whitefield said: "I would rather have five men who are led by the Spirit and walk with God than to have five hundred men at whose piety the devil laughs." Wesley said: "Give me a hundred men who fear nothing but God, and hate nothing but sin, and I can take the world for Christ." General Gordon, starting for the Soudan, said: "If you can find a man who does not love money, honor or a great name, and who looks upon God as the only source of power and might, and regards death as only an escape from misery, bring him to me, and I will make him my companion and helper; but if you can not find such a man, leave me alone with God." "Ah!" said a Brahmin to a Christian, "I have found you out; you are not as good as your Book. If you Christians were as good as your Book, you would take India in five years." Is not this the sad need of the world today sanctified Christians, baptized with the Holy Spirit, fearing nobody but God and hating nothing but sin, and free from a slavish love of the world, and as good as their Book? May God send us the sanctifying Spirit in power. VII. We ought to pray for the Holy Spirit that we may be endued with power from on high. This was Jesus' parting charge to the disciples -- they were to pray till the Holy Spirit came to endue them with power to win souls. They did pray until the Holy Spirit was poured out, and Pentecost was the result. They continued to pray, and "there were added to the church daily those that were being saved." What do Christians need now more than this power to save men which the Spirit can impart? Individually and collectively, we stand so impotent in the presence of sin and sinners. We have little power to cast out demons and to bring many to righteousness. The sermon at Pentecost resulted in the conversion of three thousand souls. A wit has scornfully said it now takes three thousand sermons to convert one soul. Moreover, the responsibility of saving men is now, for the most part, laid upon a class of hired professionals, whereas formerly all Christians felt a solemn responsibility resting upon them to bring others to Christ. Every Christian was then a preacher; that is, he bore public testimony to the work of Christ in his soul, and the power of Jesus to save. This Holy Spirit is as near to us as to the early disciples, and the same power is as possible to us as its need is urgent. All successful soul-winners are such by virtue of the Holy Spirit power that is resting upon them. President Mahan, in his "Baptism With the Holy Ghost," tells us of a man who lived in New Jersey in the early part of this century, by the name of Carpenter. For a time his Christian life was like that of thousands of others - he had only a name to live. He became painfully conscious of his moral and spiritual inefficiency and impotency, and of the absence of any assured hope or settled confidence or trust in God. He consequently set his whole heart upon attaining through the Spirit, in answer to prayer, a more perfect work of grace in his soul. At length the baptism with the Spirit came; the light of God encircled him, and after his anointing he had "power with God and with men." He was only a layman, of limited common-school education, yet his influence for Christ was well-nigh irresistible. At his funeral in the First Presbyterian Church of Newark, it was publicly stated by one of the ministers present that, from the most careful estimate, it was fully believed he had been directly instrumental in the conversion of more than ten thousand souls. And what was the secret of this wonderful power? He himself revealed it to an intimate friend a little before his death, when he declared that "for ten years he had walked continuously under the cloudless light of the Sun of righteousness, and had been in a state of entire sanctification.'' Sanctified and clothed with power by the Holy Spirit was the explanation of it all. I shall give other illustrations of this enduement of power in the next chapter. There is abundance of proof that this gift is still for us, and for all time. It is something we should all desire and pray for with unutterable longing till the enduement comes. I am persuaded there is a serious difficulty lying at the very roots of our modern church life. Our resources are so vast and our opportunities are so many, while our triumphs are comparatively so few! There must be a cause for this widespread leanness in the church of our day. We are forgetting the hiding-place of our power. I once filled a pulpit in Massachusetts. At the close of the service, a venerable ex-pastor came forward and thanked me for the sermon, and said: "It seems good to hear the ring of the old gospel once more. Our last pastor, in seventy-three sermons and prayers, by actual count, made no reference to the Holy Spirit." Here is the difficulty. We are neglecting and casting a slight upon the Third Person of the Trinity. We are trying to build up the churches without the counsel and assistance of the Master Builder, forgetting that when God would rear His temple He says to men: "Not by might nor by power, but by my Spirit, saith the Lord of hosts." O Christians, there is such an Ag ent in the Church of Christ as the Almighty Spirit of God, whose aid can be secured in answer to importuning prayer. He can lead us into all truth, and help us to live a holy life, and animate our hearts with unwonted zeal, and clothe us with the invisible power. "Ye that love the Lord, keep not silence; send up a loud, long, united and unsparing entreaty for this promised aid. This, this is what we want, and this is all we want. Till this be obtained, neither human nor angelic agency can be of much avail. 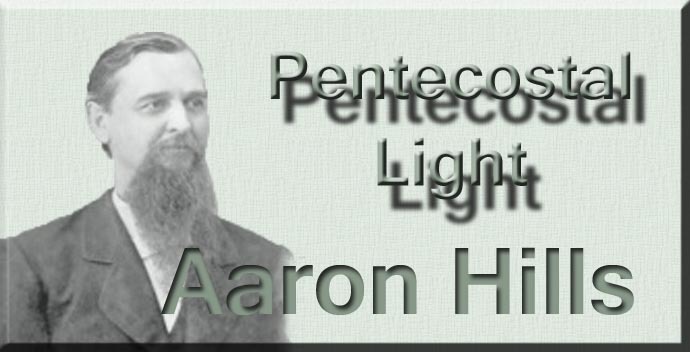 But let this Power be felt; let the ministry be fired with the faith and zeal of the apostles, and let all Christians have the purity and prayerfulness and singleness of heart of the first disciples, all, like them, having a mind to work and a heart to yearn over and travail for souls, and, as Bishop Pierce affirms, "Pentecosts might be multiplied, and converts be as numerous as the dew-drops of the morning."